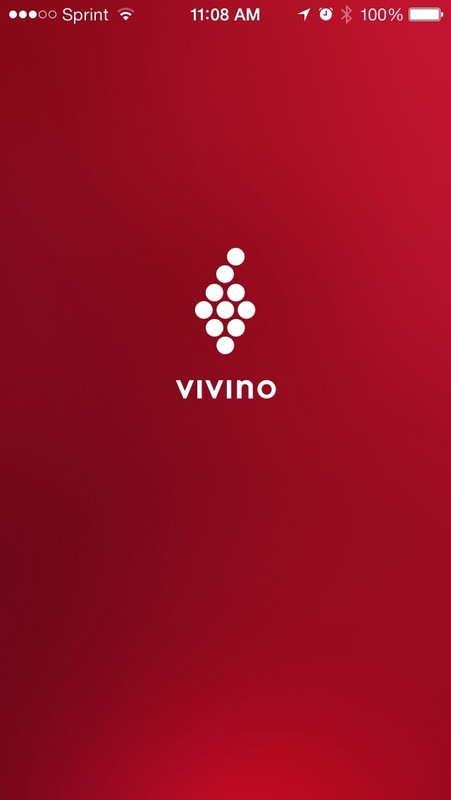 Few apps get more use on our phones than Vivino. We use it for ourselves, share it with friends, even break it out at parties. The app is simple enough; using your phone camera, you scan wine labels and Vivino does the rest, sharing other users’ ratings, tasting notes, prices and more. It also archives your scanned wines and has a social networking feature that allows you to follow other users. We like Vivino for many reasons, not least, that it is free. But as a couple, we often use it differently. Sonja’s favorite thing about Vivino is being able to “try” wines before we buy them. Ok, not really try them, but find out what other users think. A typical trip to the grocery store or Costco always includes a stop by the wine section. Many times a great sale or a stylish label will draw us in and entice us to buy, although not knowing if the wine is any good. While you’re at the mercy of the other Vivino users’ opinions, many times there is a good sampling of ratings to help make a more informed choice. In addition, the tasting notes can be helpful in pin pointing specific aspects of the wine that users like or don’t like. Recently we placed a couple bottles that we had heard about but not tried in our cart to serve at a dinner party. While still browsing, we decided to scan the wine to see if there were reviews. It came up at around three stars and comments were generally negative, expressing that the wine had a sour taste. Based on this, we opted to return the bottles to the shelf and serve a wine we knew. That’s not to say that we will never try that wine some night just to give it a shot, but we didn’t want to serve a wine to our guests that we weren’t at all sure they would like. Mark’s favorite thing about Vivino is the way he wishes we would have used it on our last trip to California. In Napa and Sonoma, we tasted and enjoyed many wonderful wines, and lately we’re developing a taste for red blends. Two that we recently encountered in particular were Cline’s “Cashmere,” which is not only a delightful wine, but also raises money for breast cancer research and prevention, and Gundlach Bundschu’s Mountain Cuvee, which they would not sample at the winery, but which we look forward to trying based on the quality of their other wines. However, this is where Vivino would have come in handy, had we used it properly while tasting. At Cline, we paid $20 for the Cashmere, which is a fine price for a bottle of wine that good. That’s also the same price we would have paid at Gundlach Bundschu for the Mountain Cuvee, though by that time we were running out of room to ship things home, so we opted to purchase only the famous Merlot from GB. But Vivino lets everyone who scans a wine label offer information about pricing as well, so in using the app, you can get a general sense of what a wine ought to cost, both on average as well as in specific locations. Again, $20 is a great price for either of those wonderful wines. Upon returning to Nebraska, though, we’ve since discovered that we can get Cline’s Cashmere at HyVee for around $14, while GB’s Mountain Cuvee runs as high as $28 in our local specialty wine shops. Not having used Vivino to scan for price averages, we bought Cashmere at Cline and Mountain Cuvee back in Nebraska for a total cost of $48 for the two bottles. Had we, on the other hand, purchased the Cashmere back in Omaha and the Mountain Cuvee from GB, the cost for the same two bottles would have been $34. With that difference, we could have purchased another bottle of Cashmere at HyVee. The moral of this story? Live and learn, and while you do, drink some wine. We’d like to emphasize that, in the end, we have two excellent bottles of wine in our “cellar,” and we don’t feel bad about that. This is in no way a complaint about Cline, a winery we love dearly and whose wines we regularly enjoy. We recommend both wines and both wineries to everyone, but we also recommend Vivino for price-checking. 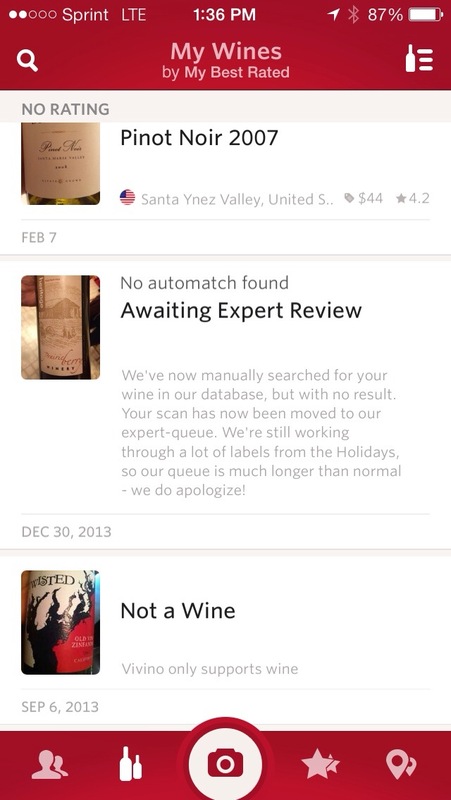 One last, fun feature, is playing “stump the chump” with your Vivino app. “Not a wine” is a message you’re likely to get from time to time when for whatever reason the app can’t find your wine. Sometimes, it can’t automatch your scanned wine label, but their staff will attempt to match your wines manually. As you can see, however, they’re not perfect. Twisted’s Old Vine Zin, while not our favorite Zinfandel around, is still definitely a wine, and we’ve been waiting on that Prairie Berry match for about two and a half months now. Good thing we’re patient people. All things considered, Vivino is one of our favorite wine apps. We use it to inform our purchasing decisions, get our scan on at parties, and even show it to bartenders, servers, and the occasional sommelier. Best of all, it’s free, and any money we don’t spend on apps is money we can spend on wine! We don’t have a rating system worked out at the moment, so for now let’s call it four thumbs up. We recommend Vivino to our friends and, of course, we count you among them.